Towing a trailer requires more skill from you as a driver, and puts more strain on your car. In this article we’ll discuss the skills you will need to develop, what the requirements are for your car, what should you watch out for, and how you should maintain your trailer. If you are on a learner or restricted licence (class 1) you can tow a trailer, but the combined weight of the vehicle, trailer and load must not exceed 4500kg. When you get your full licence the combined weight can be up to 6000kg. If you have a restricted or full car licence you can drive an agricultural tractor-trailer combination of up to 25,000kg that’s being used for agricultural purposes as long as you do not exceed 40kph. On a full car licence you can also drive the same combination at up to 30kph for any purpose (i.e. including non-agricultural. There are general purpose trailers as well as trailers specific for one or two purposes. The following are the main types of trailers you will encounter on the road. Flat-bed trailer: these are generally able to be hired from petrol stations and the like. They have a flat deck with low sides and sometimes have high cage sides. 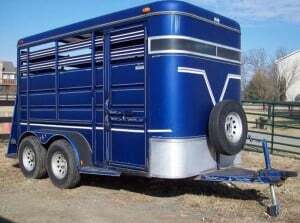 The rear of the trailer usually has a gate that folds down and/or a gate and cage that opens to one side. They may also be a tipper trailer where the back tips downwards to aid with unloading materials. Vehicle trailers: these come in several types which may allow you to carry two- or four-wheel vehicles. Car trailers will have two ramps and often some tipping ability; motorbike trailers may have one or two ramps and could have special fixtures to allow bikes to stay upright. Both are likely to have specific areas to tie down the vehicles to stop them moving on the trailer. 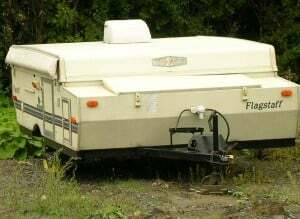 Caravans, camping trailers and pop-up campers: a caravan is the largest of these, being a full-sized trailer. Camping trailers and pop-up caravans are compacted versions which expand as you need them and therefore offer less wind resistance. Boat trailers: a boat trailer usually has a central V to take the boat’s hull, and a winch at the front to wind the boat in. They can also be built to accommodate one or more jetskis. The V will usually be padded to avoid damage to the hull. The whole trailer will be built of galvanised components which resist rust well. A braked trailer has brakes on the wheels of the trailer that are activated when you activate the car’s brakes. Some trailers’ brakes can be activated separately from the car’s brakes. An unbraked trailer does not have brakes. 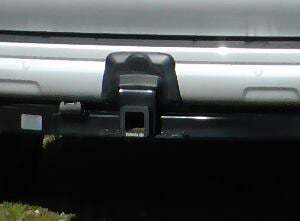 A trailer will have either tow coupling (tow hitch – as shown) or a tow ball, a safety chain and electrical connections for lights and, if fitted, brakes. The couplings and tow balls will have a rating for the maximum load and this is marked on the coupling itself. You must not tow any more than one trailer or vehicle at a time using a car or light truck. Trailer loads must not extend more than four metres behind the rear axle. Any load that extends more than one metre behind the trailer must have a white flag, or an orange, red or yellow fluorescent flag tied to the end that is at least 40x30cm in size. The load must be secured to the trailer and must not drag on the ground. The load can extend in front of the trailer. The maximum width of the trailer and load is 2.5m (1.25m either side of the centre of the trailer. A trailer’s load must be distributed evenly. An uneven load will cause the trailer to behave unpredictably and it will affect the car’s handling more severely. The trailer’s load must not lift the tow bar of the towing car. Ideally it will exert around 5-10% of its weight on the tow ball, and you should have 50-60% of the weight of the load forward of the axle. The trailer will exert forces on your car that will make it feel very different to drive, especially if you have a dynamic load like a horse. When you brake, the trailer will exert force forwards the back of the car. An unbraked trailer is completely relying on this force for braking, whereas a braked trailer has its own brakes to help slow it down. When you are accelerating the trailer resists this acceleration, slowing your ability to pick up speed. The trailer will also exert some downwards force on the tow ball or tow coupling. This force should never be too much (usually less than 100-150kg), and should never be a negative force (i.e. a lift) as this is dangerous – more about this below. Most simple trailers have no suspension, simply relying on the tyre sidewalls to provide some cushioning. They tend to bounce around more over bumps and this can cause the load to shift if it is not secured properly. If you have driven over a particularly bumpy piece of road it’s a good idea to stop and check that the load hasn’t shifted. A load shifting mid-corner can tip a trailer on its side. Strong crosswinds can be problematic for high-sided box trailers and horse floats. It will be particularly noticeable if you drive from out of a shaded area into an area with a strong crosswind, or, for example, over somewhere like the Harbour Bridge in Auckland which is more exposed. 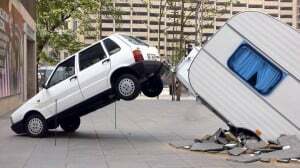 Unexpected gusts of wind can move the trailer around and that will also move your car. Headwinds, especially on unaerodynamic trailers, can make it more difficult to maintain speed going uphill, and make it more difficult to lose speed going downhill – beware of brake fade. More aerodynamic trailers such as the pop-up camper shown are less affected. Tall loads with a high centre of gravity, such as horses and large boats, require much slower cornering than low, flat, static loads such as aggregates or chopped logs. Can your car tow a trailer? how many driven wheels it has – two- or four-wheel drive influences the amount of grip available, and is mainly relevant for towing on wet or muddy surfaces such as for boats, horse floats and agricultural purposes. Your car will usually have a rating for both braked and unbraked trailers. The maximum weight for an unbraked trailer and load is usually 750kg. For a braked trailer and load the maximum weight can be up to 3500kg, but almost all cars will not be able to tow this amount, and it will only be large, powerful SUVs and utes that will get up to 3000-3500kg in towing capacity. A smaller car is likely to top out at around 1200kg towing capacity, and a larger car around 2500kg. Exceeding the towing capacity is dangerous because you can bend the chassis, or the car might not be heavy enough to exert enough control over the trailer. If your car already has a tow bar fitted it will be either a factory model, or a third-party model. There will be marks on it to tell you what the maximum rating is. Your trailer must not exceed lower of the rating capacity of the tow bar or tow coupling, the maximum towing capacity of your car, the maximum towing capacity of the trailer, or the maximum weight bearing capacity of the tyres. As the trailer could be wider than your car, it could block rearward visibility from your wing mirrors. You should buy special mirror extensions to allow you to see behind you. Many trailer will also block your view out of the rear window. When you are towing anything (this includes another vehicle) there must not be more than 4 metres gap between your car and what you are towing. Because of the increased load on your car, the towing limit for a car or light truck with a trailer is 90kph, and if you are towing a motorbike, the maximum speed is 30kph (the motorbike must be mechanically disabled). All towed vehicles and trailers must show a red light at the back at night, and if you are towing a disabled vehicle, its headlights must light up the towing connection. If you are towing with a rope or strop as opposed to a rigid towing system like a tow coupling or tow bar, your maximum speed is 50kph. Consider the type of load you will be towing and where you will be towing it when you choose your car, or before you tow. If you are taking a boat to a boat ramp, boat ramps are slippery and a two-wheel drive car may not have enough grip to pull the extra weight of a boat out of the water. If you are launching from a beach, a two-wheel drive car may get bogged down in the sand, or may not have enough ground clearance, especially if loaded with other luggage. Avoid sharp movements when driving as these can cause your trailer to start swaying or snaking. If this happens try to avoid touching the brakes unless absolutely necessary. If you can activate the trailer’s brakes separately, do this. The worst case scenario for you here is that the trailer tips on its side or jack-knifes. Newer cars come with trailer stabilisation systems that help prevent this. Look at least eight seconds ahead to give yourself plenty of time to react. Take more frequent breaks because driving with a trailer is more fatiguing than driving without a trailer. Take care when unhitching your trailer that it is not on a slope and at risk of running away. You will be an obstruction to other road users when you are towing, and you must not unreasonably impede their driving. This means that if there are passing bays, you must use them; if you can stay well left, then do so; in passing lanes, ensure that you are courteous and allow others to pass. If you are holding up a line of traffic you must stop periodically to let them past if the road doesn’t have passing areas – this is particularly important on roads such as the Thames/Coromandel coast road. If you are following another slower vehicle, leave plenty of room – observe the four-second rule. For one, your braking distances will be longer, and two, other vehicles overtaking you need a safe place to pull in. Now you know about towing, it’s important you know about brake fade. Click here to read how to prevent it. ‹ What should you do if you have a crash or accident? What should you do if you have a crash or accident?